Are you cooking with quinoa? If you aren’t, you should reconsider. It’s one of those whole grain, fiber powerhouses and it’s so good for you. 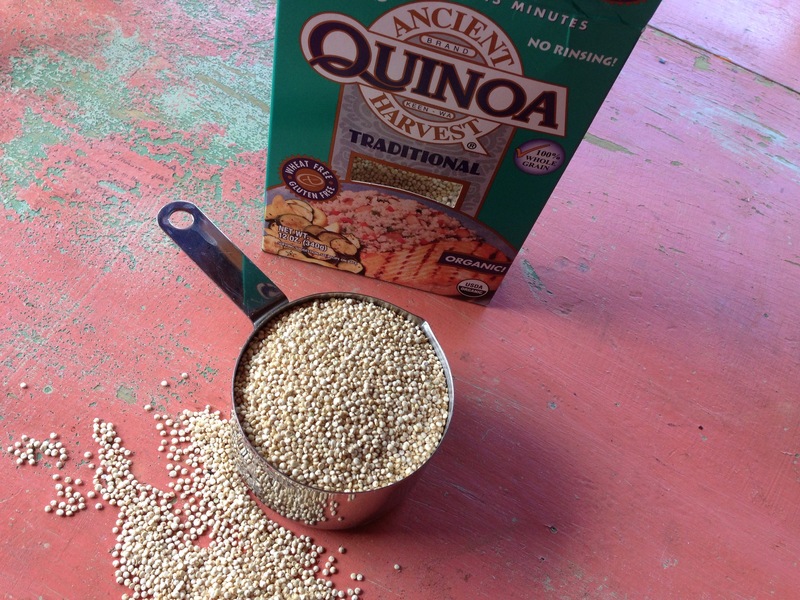 According to the Ancient Harvest Quinoa box, quinoa is a complete protein grain on it’s own. They also claim it contains more protein than other grains. It’s gluten free too, which is good for those who can’t tolerate wheat products, and it’s really quick to prepare – even up here at the Dusty Dog with it’s high elevation. 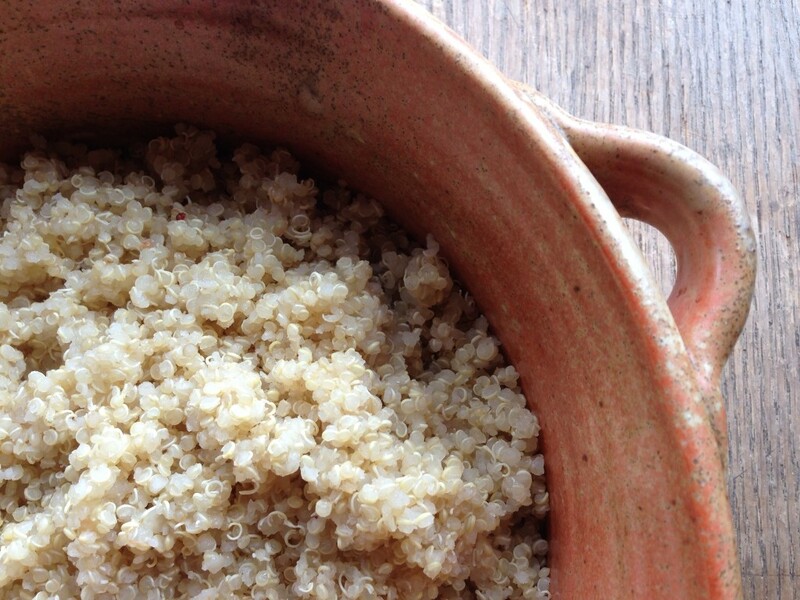 Unlike brown rice, quinoa only takes about 15 minutes from beginning to finish. Over the past six months quinoa has been one of those new additions to my diet and a part of my purging of the white foods. I’ve lost 11 pounds and three pant sizes by eating more grains, beans, fatty fish, and tons of fruits and vegetables. Quinoa has been an integral part of my transformation. During the summer months, I love serving cold foods I can prepare in advance, and quinoa works really well as a base for these types of dishes. This summer I’ve been using quinoa in place of pasta in pasta salad and have been making enough to have it in the fridge to add to mixed grilled vegetables at dinner. 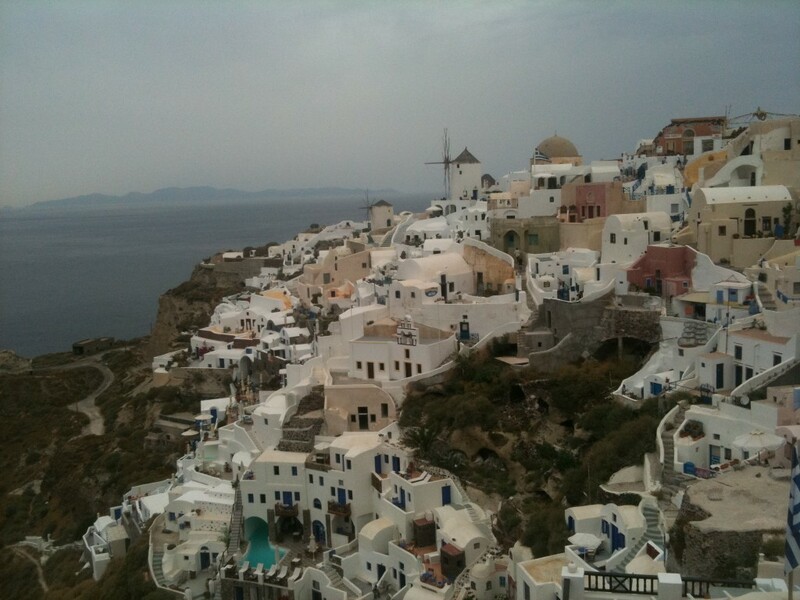 Lately, several friends of mine have been posting photos on Facebook of their Greek Island summer vacations, and it’s made me think back to a couple of years ago when we visited the Island of Santorini and had a beautiful Greek salad in the tiny town of Oia overlooking the breathtaking scenery of one of the most romantic spots in Greece. This was the view as we ate that magnificent salad and drank delicious wine. It was a cloudy, overcast day, but that didn’t dampen our mood and the beauty of the surrounding hills and stunning architecture. 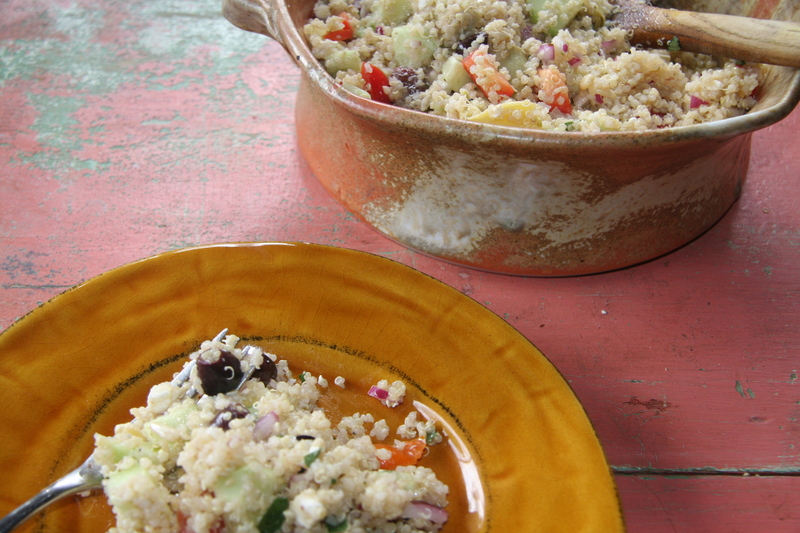 So, all those photos of my friend’s Greek vacations made me think, why not make a Greek quinoa salad. I’m clearly not the first person to have such an epiphany. An internet search pulled up many Mediterranean and Greek quinoa salads, and my salad is not much different from theirs. 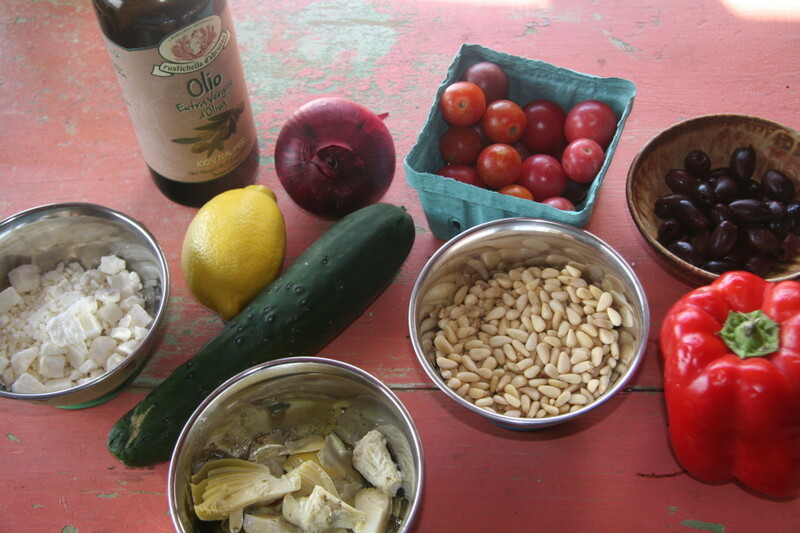 I’ve added a couple things that have nothing to do with a Greek salad but are Mediterranean – things like artichoke hearts and pine nuts. I thought they’d add some nice flavor, a little crunch and a tiny bit of something different. 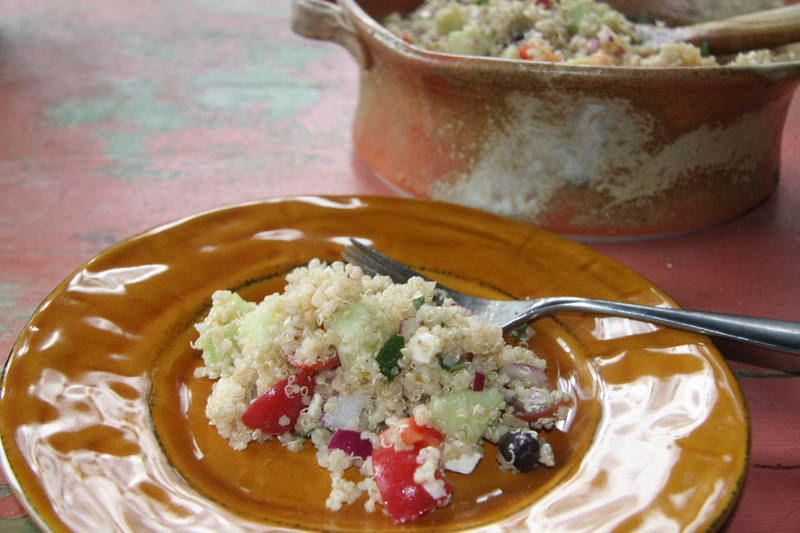 This Greek quinoa salad will be the perfect cold side dish to serve with dinner tonight for our neighbors who are coming over for a sit down by the fire at our new fire pit that Rhonda and I built – no easy task in the rocky mountains where every inch of digging produces a wide variety of small, medium, and super sized rocks. 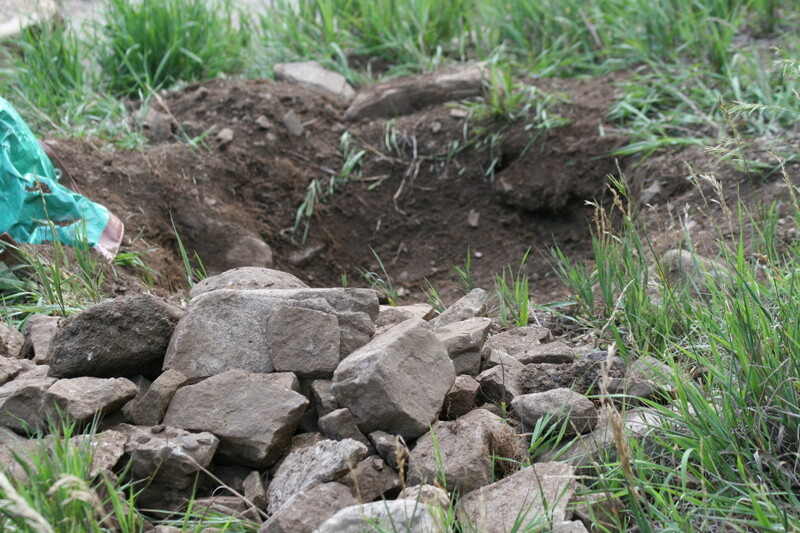 See all of those rocks – that’s what I’m talking about! 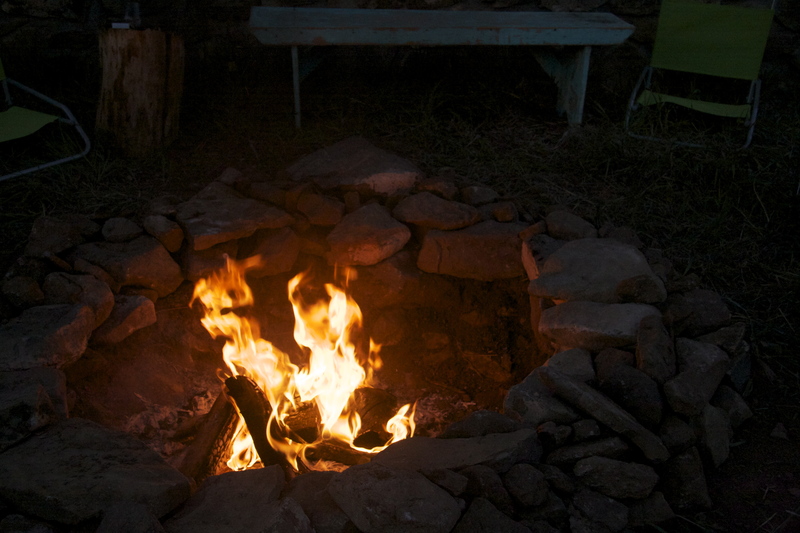 Building that fire pit has made me realize we can do just about anything to which we set our minds. It was some really hard work, and one of my shoulders is still out of whack. 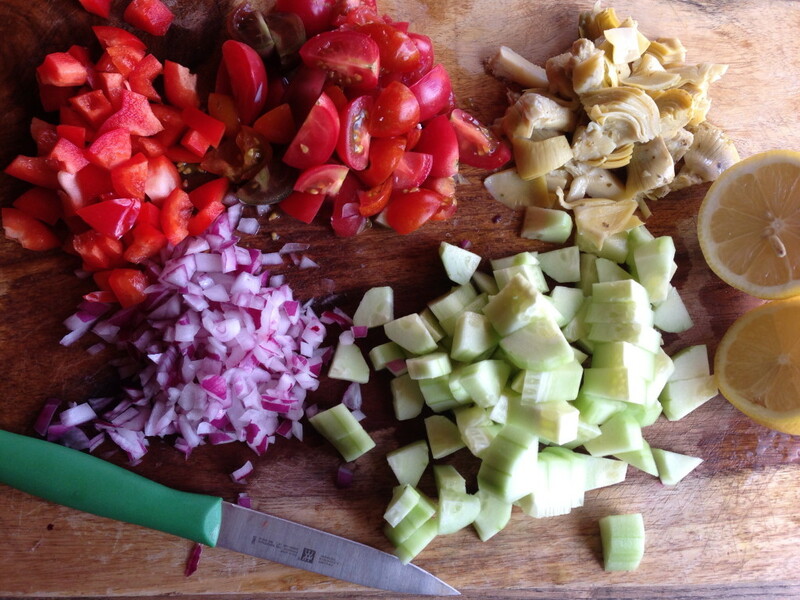 Dinner tonight will be a healthy mix of Mediterranean ingredients with nutty quinoa playing a major role. I’ll make the Greek quinoa salad this morning and it will be the perfect side to the garlic shrimp Rhonda plans to make on the grill tonight. We’ll add a nice green tossed salad and it will be a complete meal. Easy, quick, and simple this cold, do-ahead salad is the perfect addition to your next summer get together. Place one cup of quinoa in a sauce pan and add 2 cups of water. Bring to a boil and reduce heat. Cover and simmer for 15 minutes. When time is up, turn off the burner and keep covered for 15 minutes to absorb any extra liquid. Set aside to cool. Put all of the ingredients into a large bowl and mix until well combined. Chill for several hours before serving, so the flavors have time to combine. This entry was posted in Quick & Easy, Recipes, Salad, Sides, Uncategorized, Whole Grains and tagged artichokes, Easy & Quick, Entertaining, Feta, High Altitude Cooking, One Dish Wonders, Peppers, picnic, Quinoa, Salad, Sides, tomatoes, Vegetables, Vegetarian. Bookmark the permalink. What a great idea. 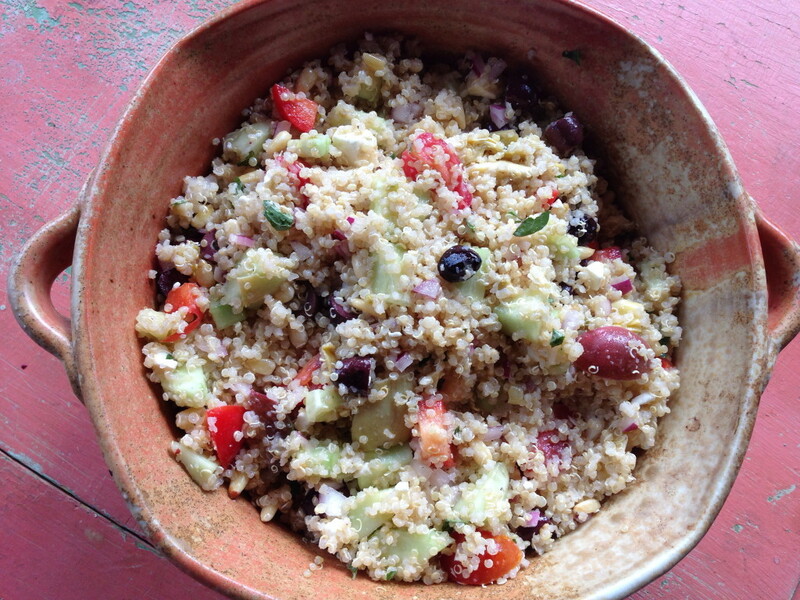 It has been very hot in Dallas, and learning about Quinoa salad hit the spot! Faye, this is the perfect side dish for hot summer days! There is a print button at the bottom of each post and it only prints the story and recipe not the photos. Hope you like the quinoa salad! Cannot wait to give this one a try! 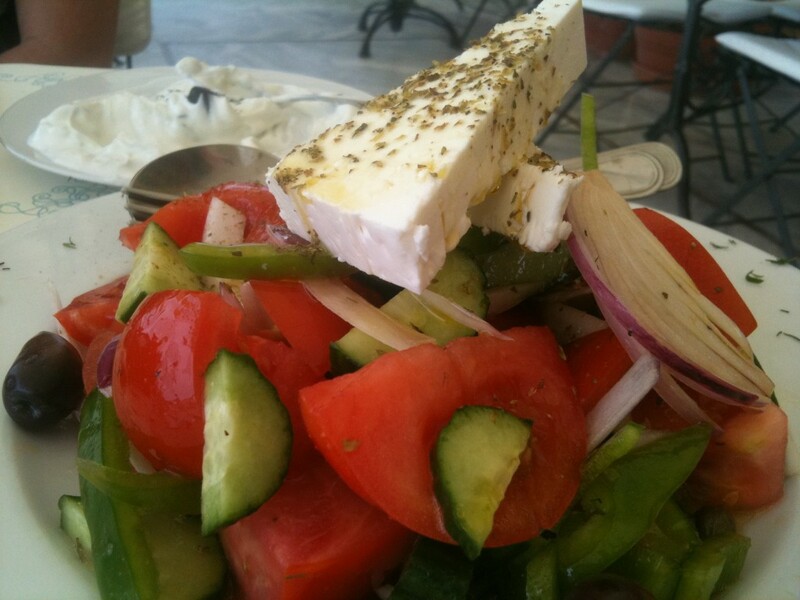 I was just looking for a Greek salad recipe 2 days ago: This looks simple to make, healthy, and delicious! Thank you!